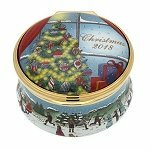 This beautiful 2017 Christmas box depicts a mystical Christmas snow scene at night. 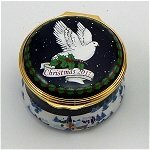 The lid features an illustration of a dove bearing a branch of holly and ivy with the words 'Christmas 2017' decorating the surface. 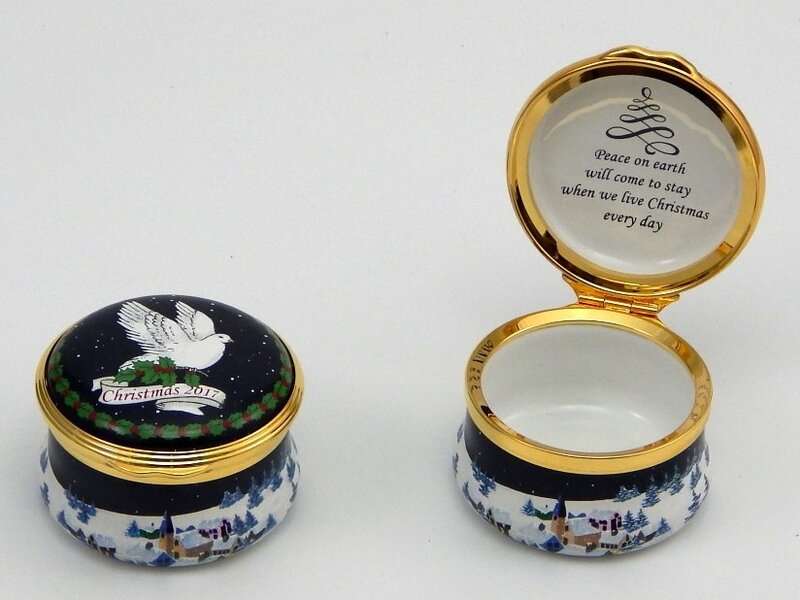 The inside lid is thoughtfully inscribed with the words, 'Peace on earth will come to stay when we live Christmas every day'. 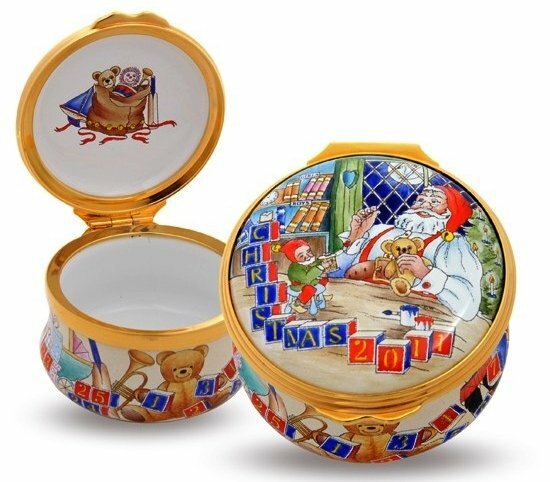 This box is the 44th edition in the series, the intricate design epitomizes the festive season as each of the Christmas boxes have done so well. 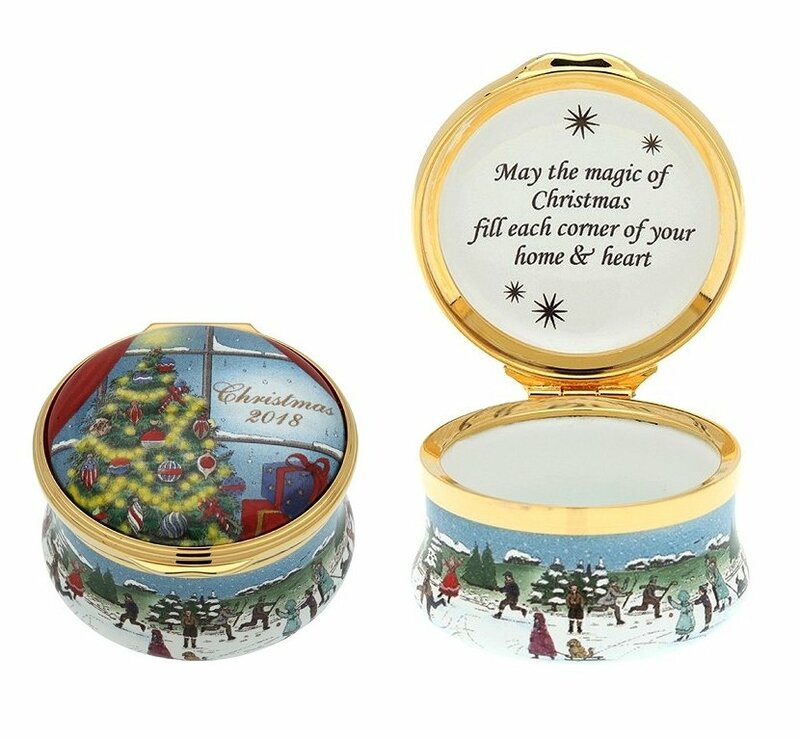 It is gold plated and hand decorated and comes in a festive red box making it a special Christmas gift that is sure to be treasured for generations. Diameter: 1 3/4 Inch Height: 1 1/8 Inch. 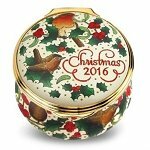 Add the exquisite 2016 Christmas Box to your collection! 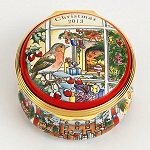 The 43rd edition in the series, the intricate design continues, as its predecessors did, to epitomise the festive season. 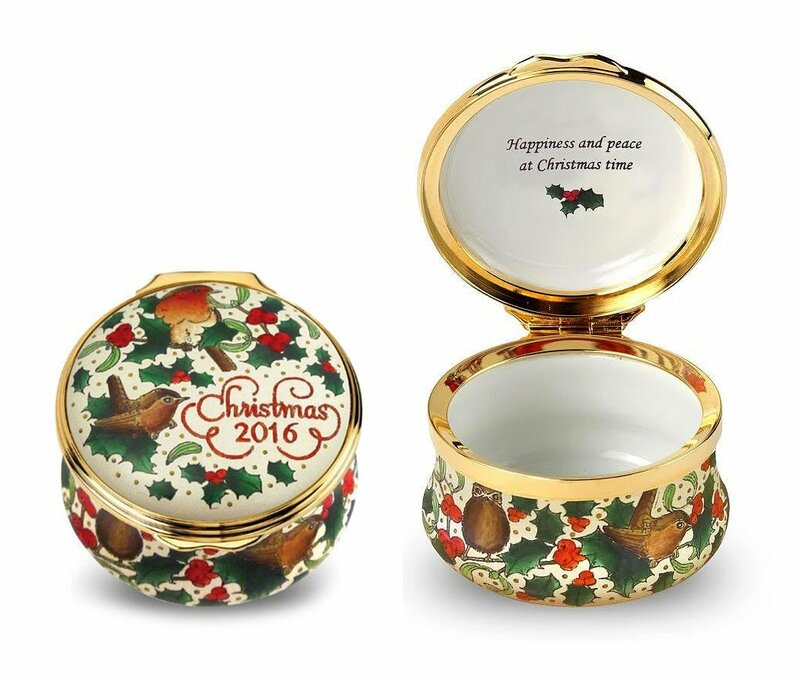 Gold plated and hand decorated, the charming design of this enamel box features illustrations of Christmas robins sitting amongst branches of holly and ivy. This years annual features a bird sitting outside a beautiful living room decorated for Christmas and the stockings hung for Santa. 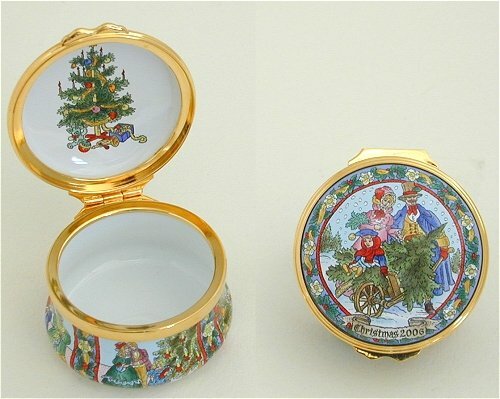 This festive hinged copper box is handmade and hand-enameled in England with 24k goldplated fittings. 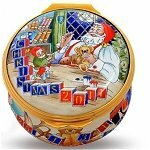 Box is 1 3/4 inches d. x 1 1/8 inches h.
Santa is busy in his workshop with a helpful elf at his side. The dating for this 2011 box is on the childrens blocks on his bench. Halcyon Days Christmas 2010 Annual Box. 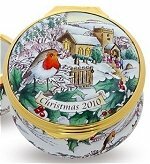 A robin sits in holly with a traditional Christmas scene of the English countryside wrapped in a Winters snow. Churchgoers wend their way to their worship and children play in the snow. 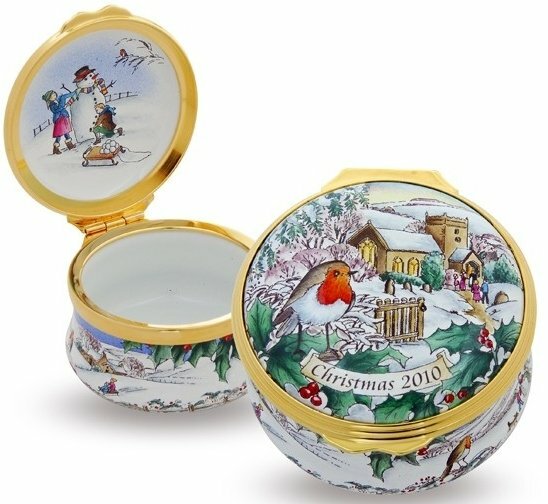 The base of the box has a Winter scene around it and the inside of the lid has two children putting the finishing touches on a snowman. Halcyon Days Christmas 2006 Annual Box. 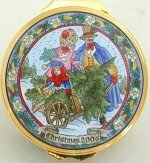 A Victorian family bringing home the tree is the theme for this year's dated box. 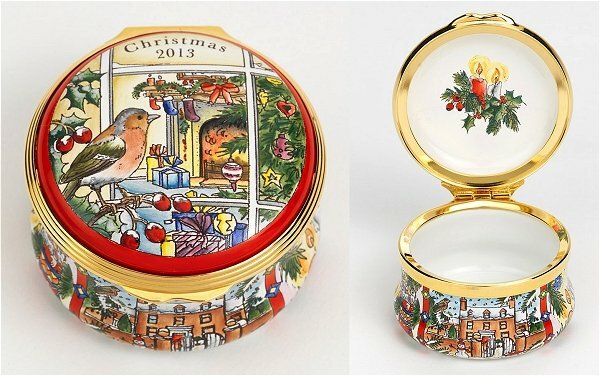 A perfect box for the toe of someones Christmas stocking.